There are several components to a successful solar panels installation. Aside from choosing a solar installation with sufficient solar panels to meet your power needs, it’s critical to find a qualified solar installer who will properly put together your solar panels installation. Clever Energy serves many cities in the greater Orlando area—including Casselberry, Altamonte Springs, Deltona, Oviedo, Kissimmee, and Saint Cloud. We’re a solar installer with the knowledge and experience to help you choose your optimal solar installation, and to successfully put it into place at your home or business. 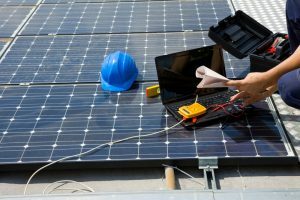 Businesses in bustling Orlando and the smaller Osceola County towns of Kissimmee and Saint Cloud can benefit from a custom solar panels installation. They only need to meet a few basic criteria to qualify for a solar project. For example, they should own their place of business—and it should be in a standalone building like a freestanding restaurant, shop, office, or warehouse. If business owners can satisfy these simple criteria, they can enjoy a custom solar installation from Clever Energy. The solar power system that Clever Energy installs is a business investment with excellent returns, reducing reliance on third-party electrical suppliers. It may also entitle your business in Saint Cloud or Kissimmee to solar power incentives, including tax credits. Like many businesses with a solar installation, you can spread the word about it far and wide by highlighting it on your product packaging. Your clients or customers might find your dedication to a greener planet so inspiring that they become devoted supporters of your business, encouraging their friends to buy your products and services. The rewards of a solar panels installation from Clever Energy aren’t just for business owners. Homeowners who meet similar criteria of property ownership can gain many of the same advantages. When Clever Energy performs home solar panels installations north of Orlando in Altamonte Springs, Casselberry, Oviedo, or Deltona, the savvy homeowners can qualify for tax breaks and other solar energy incentives. They also increase the value of their homes and make them more attractive to prospective buyers. Further, a home solar panels installation in Central Florida can mean getting credit for the solar energy produced from Duke Energy or Florida Power & Light through a net metering arrangement. While most homeowners are on a one-way street of buying and consuming power from their electric company utility, homeowners in the greater Orlando area with a solar panels installation from Clever Energy can actually earn credits on their electric bill for any excess solar power their home solar system generates. To learn more about the benefits of a solar installation for your home or business, call Clever Energy today at (407) 274-1531. You can also email us at info@gocleverenergy.com. Whether you want to work with us in English or Spanish, we’re happy to explore the benefits of a solar power system with you.